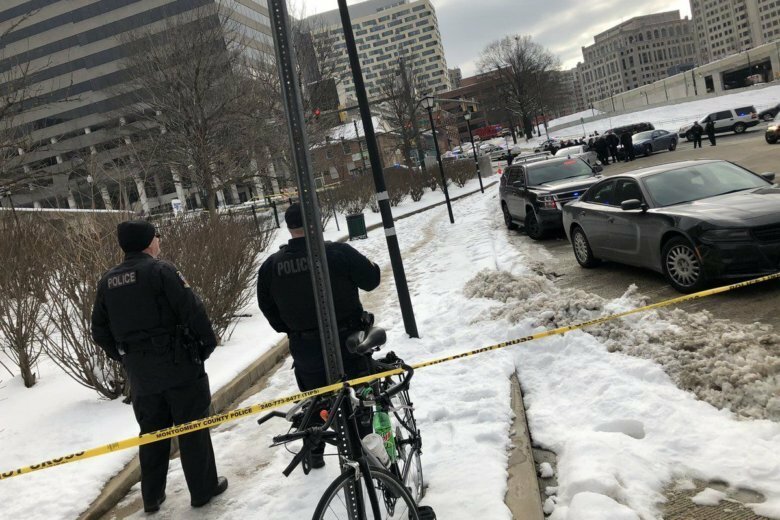 WASHINGTON — The Montgomery County police have identified the bank robbery suspect who was shot and killed in Silver Spring, Maryland, Wednesday, as well as the officer who shot him. The police in a statement Thursday said Mikyas Mehary Tegegne, 31, of no fixed address, tried to rob the BB&T Bank on Wayne Avenue, near the Silver Spring Metro station Wednesday morning. Asst. Police Chief Marcus Jones said Wednesday that the suspect walked into bank manager’s office at about 10:45 a.m. Wednesday, showed a gun, said he had a bomb in his backpack and demanded $20,000 in cash. Jones said the manager went to a teller station and the “panic button” was pressed, alerting the police. The suspect eventually left without money — after he heard sirens, Jones said — and headed for the alley behind the building near the Metro station. The suspect was shot in an alley behind the building and died from his wounds at a hospital. The police also identified the officer who shot Tegegne as Christopher LaPointe, and added that he has been on the force for two and a half years. He’s been placed on paid administrative leave during the investigation. The police said they believed Tegegne is the same person who robbed a Sandy Spring Bank on Colesville Road Dec. 24. In that robbery, he also claimed to have a bomb and made off with an undisclosed amount of cash, police said. Buildings were evacuated and roads closed on Wednesday; the bomb squad eventually determined that there was no bomb in the backpack.